Of the great medical mysteries remaining to be solved, the greatest doesn’t center on a single disease like cancer. The greatest mystery is how we heal. The healing response is vastly complex because it involves every system in the body, including the brain. The immune system fights on the front lines, but the body’s superhighway of information reaches every cell when disease and distress is present. The healing response keeps us alive and thriving. With all its knowledge, medical science cannot even heal a paper cut on its own — we are always working in aid of the body’s own healing system, beginning with the power of the mind. The wellness movement is looking beyond prevention, which deals in risks for specific disorders like heart disease, hypertension, and type 2 diabetes. A picture is emerging of how each person can consciously boost the healing response — we are entering a new era of self-care: The Healing Self. The Healing Self is a role you choose, one that applies to everyday lifestyle choices like diet, sleep, and stress management. Each choice either aids the healing response or hinders it. What aids the healing response? These things may not sound surprising, but what lies behind them is a wealth of new knowledge. For the first time we can prioritize our lifestyle choices. The benefits of good sleep are more critical than ever. Equally beneficial is moderate exercise every day. And, both lifespan and healthspan can be lengthened by strong relationships. The threat of low-level chronic inflammation is now linked to every chronic disorder. The role of low-level chronic stress, the kind everyone experiences in modern life is doing the greatest harm, impeding the healing response. These insights are based on a broad understanding that the lifestyle disorders that need prevention — type 2 diabetes, coronary artery disease, and hypertension, cancer, Alzheimer’s — have their beginning years before symptoms appear. Previously no one would have suspected that Alzheimer’s begins decades before old age, or that brain inflammation is the final straw that breaks the camel’s back. But with this new knowledge, we argue that adopting a lifestyle of self-care that fosters “self-healing” is the key to wellness and disease prevention. The other side of the coin is about choices that hinder or harm the healing response, most of which are bad habits that the healing self must consciously avoid. What harms the healing response? The habit of isolating oneself, sitting at the computer, watching TV or playing video games for hours on end without getting up to move, snacking on junk food, depriving oneself of sleep, and losing control of one’s weight — these are all too common in American society today. Showing people how to move from the negative to the positive zone in their own self-care is the focus of The Healing Self. The prevention movement taught us that noncompliance is a constant problem. Even with the best information, people can’t follow up on their good intentions. The fact that only 2 percent of dieters can lose five pounds and keep it off after two years tells the tale. Prevention has also taught us that fear is a poor motivator. People don’t want to live with fear, and they easily find unhealthy ways to suppress anxiety, like “eating your feelings” or spending all day at the computer. The Healing Self is the next evolution of the prevention movement. The healing self could fall into the same pitfall, becoming just another addition to the mountain of medical knowledge that already exists. But our aim is to make it a personal breakthrough instead. The key to adopting the role of the healing self is living everyday with the self-awareness that your brain, body, and mind are intimately connected as a unified entity that serves you. One must walk the path from unconscious living (ruled by old habits, conditioning, denial, low self-esteem, and endless distractions) to conscious living. The secret to conscious living is actually very simple: The next thing you want to do needs to be the best thing for you. In our book we take the reader on a journey to expanded consciousness, and the reason we have confidence that this works is that each step of the way involves the desire for health, happiness, and fulfillment, without any motivation through fear and anxiety. There is a new revolution in healthcare, and that revolution is you! 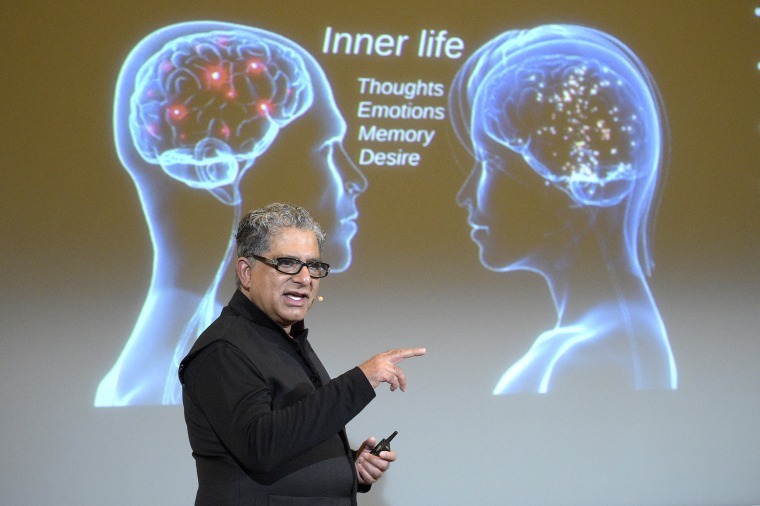 Deepak Chopra MD, FACP, founder of The Chopra Foundation and co-founder of The Chopra Center for Wellbeing, is a world-renowned pioneer in integrative medicine and personal transformation, and is Board Certified in Internal Medicine, Endocrinology and Metabolism. He is a Fellow of the American College of Physicians and a member of the American Association of Clinical Endocrinologists. His latest books are The Healing Self co-authored with Rudy Tanzi, Ph.D. and Quantum Healing (Revised and Updated): Exploring the Frontiers of Mind/Body Medicine. Rudolph E. Tanzi, Ph.D. is the Joseph P. and Rose F. Kennedy Professor of Neurology at Harvard University and Vice Chair of Neurology at Mass. General Hospital. Dr. Tanzi is an internationally acclaimed expert on Alzheimer disease, for which he has discovered nearly a dozen genes. He has won the highest awards in his field and was included in TIME Magazine's "TIME 100 Most Influential People in the World." He is co-author of Dr. Chopra's latest book, The Healing Self.